This weekend we hit Portland Dining Month again. Our trip to 23Hoyt was fun. Fancy, romantic and very classy. This time I wanted to try someplace a little more homey, casual with comfort food. 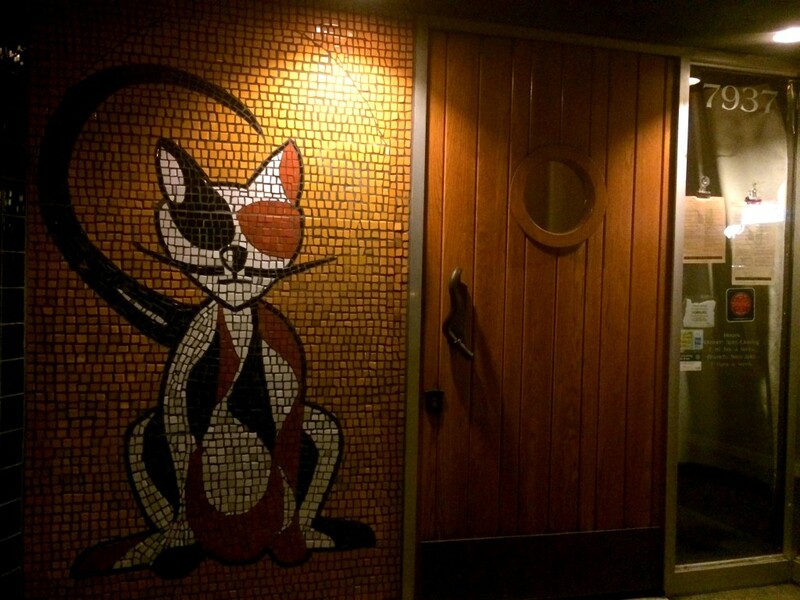 So we headed over to The Country Cat, in the Montevilla neighborhood. They lured us with fried chicken! Paired with mashed potatoes and gravy it was the perfect menu for a Sunday night dinner. Unlike 23Hoyt, and most of the other restaurants, The Country Cat only offered one meal for their Dining Month special. So we ordered it along with a burger and an order of their soft pretzels. All to share. 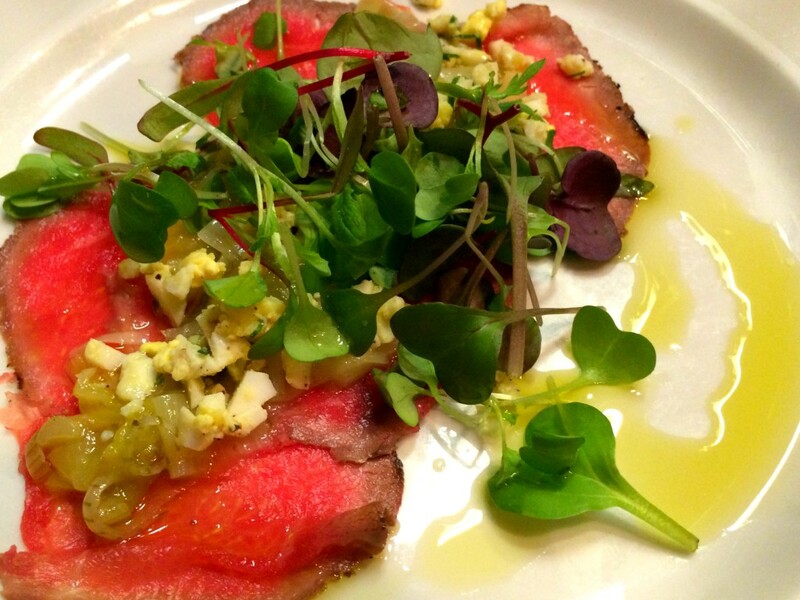 First Course: Black pepper-crusted beef carpaccio with truffled leeks, hard cooked egg and celery leaf salad. Beautiful presentation and it tasted great! Fresh flavors to compliment the beef. I loved it. It seemed a little too “fancy” compared to the rest of the menu but I guess it’s fun for restaurants to try something a little different. I would have been just as happy with their pickle plate or the deviled eggs off their regular menu. We also had an order of soft pretzels. 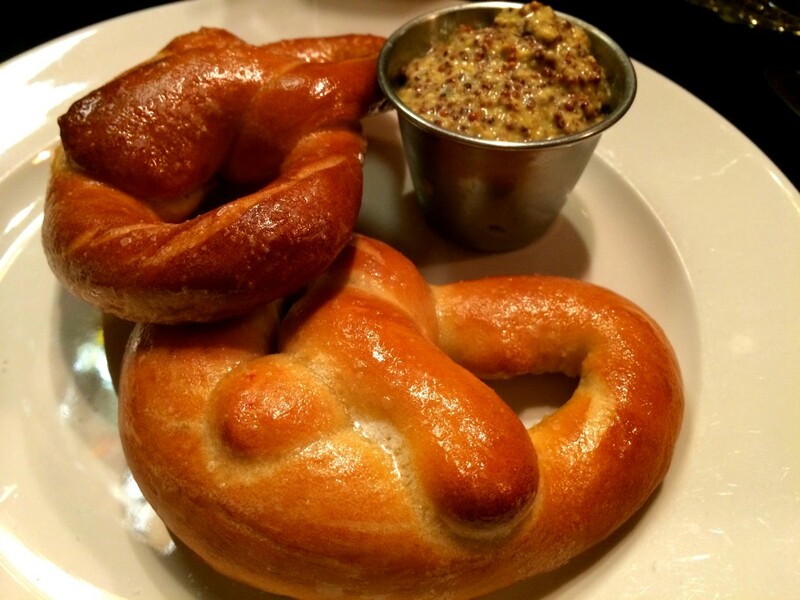 I’m kind of a soft pretzel fiend, so I had to do it. They were above average, but the real star was the mustard. Wow! It was so strong I actually cried. Nice work, Country Cat. I like a restaurant that serves a strong mustard. Many places wimp out with mustard. 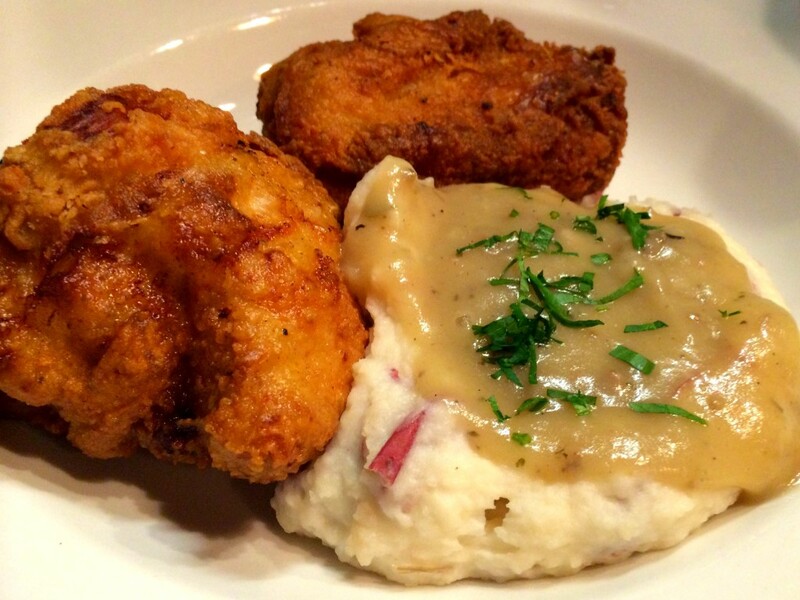 Second Course: Cast Iron Skillet-Fried Chicken with mashed potatoes and country gravy, a regular menu item for $15. This was excellent. Beyond excellent. I would put it on a list of Portland’s “must-eat” dishes. First of all, the chicken was perfect: juicy with thick flavorful breading, rich and salty. Not only is it perfectly flavored, but it’s easy to eat because it’s boneless! A pleasant surprise. Since you could eat it with a knife and fork, it made the potatoes even better. They were a little chunky and covered in a thicky gravy. Jacob was in heaven. He’s a gravy lover. The burger arrived with a huge plate of onion rings, although I would called them onion strings. They were fantastic. Sweet and crispy without being too greasy. The burger patty was thick, there was almost more meat than bread! Although the diameter was smaller than the standard burger. bigger than Little Big Burger but still on the smaller side. But for the price $10 including the onion rings, it’s a really good deal. Third Course: Carrot cake with cream cheese frosting and candied walnuts. We shared it because by this point both of us were FULL. No need for a second dessert. The cake was pretty good. 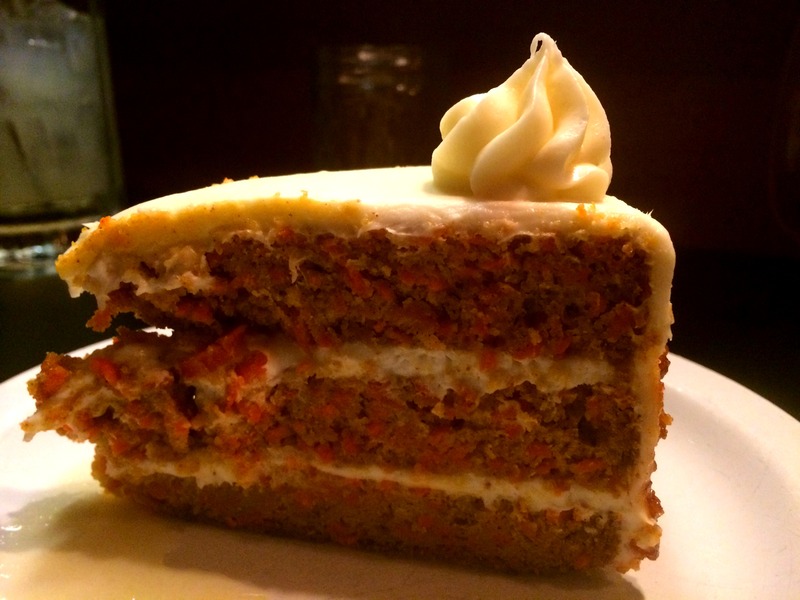 As usual with carrot cake, the cream cheese frosting is the best part. I did not like that it had obviously just come out of the fridge, which I don’t like. I prefers my cake at room temp, but I have a feeling the health department does not agree. After that meal, I highly recommend The County Cat to everyone. If you want fried chicken this is the place. If you want a good burger, also a good option. It is a great sign that I left wanting more. They have an entree on the menu called “The Whole Hog” which sounds like a fun challenge, lots of pork. I also want to try their trio of puddings on the dessert menu. I’m a sucker for butterscotch. So go! 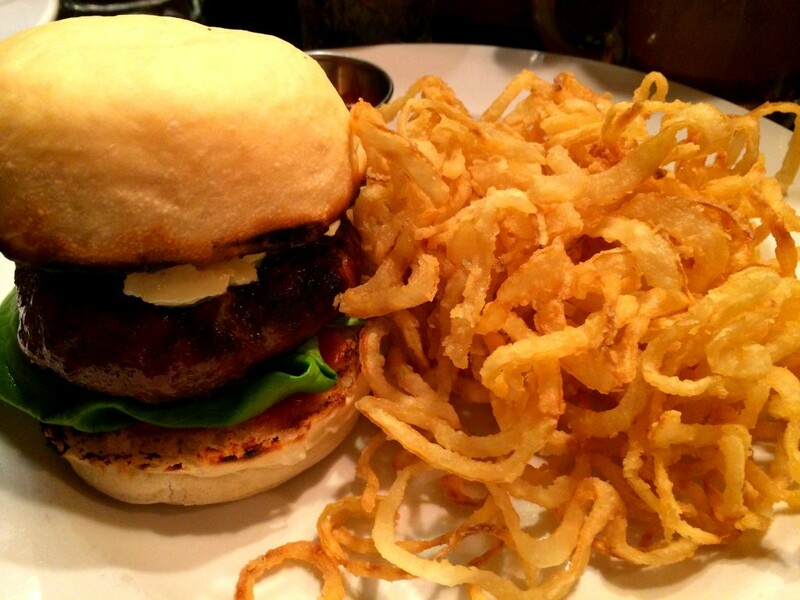 Try the Portland Dining Month menu or try everything else. We left very full and satisfied. Mmm, those dishes look delicious! I may have to try out The County Cat sometime! I love the Country Cat! I had duck for the first time there. Their homemade rolls are amazing!